Oppo recently launched Oppo A3s smartphone with Dual Rear Camera. 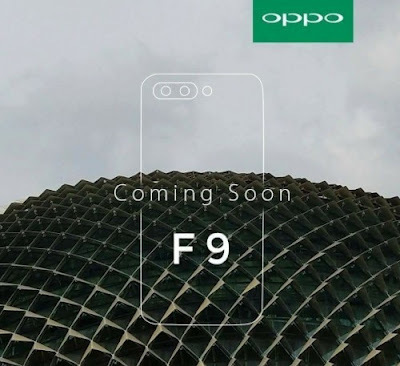 Now Oppo is working on New F Series smartphones which will be Oppo F9 and Oppo F9 Pro expected to feature Dual Rear Camera. According to Leaked teaser Oppo F9 to come with a dual camera setup on the rear stacked in a horizontal position with an LED flash on the top left corner. OPPO F9 has also cleared Bluetooth certification (version 4.2) on July 18 with model number CPH 1823, CPH 1825, CPH 1881 of which the CPH 1823 is speculated to be OPPO F9 or OPPO F9 Pro while the other two will be regular variants with different memory configurations. Oppo F9 will likely to be powered by the same MediaTek Helio P60 chipset (MT 6771). Oppo F9 Series expected to launch in August.